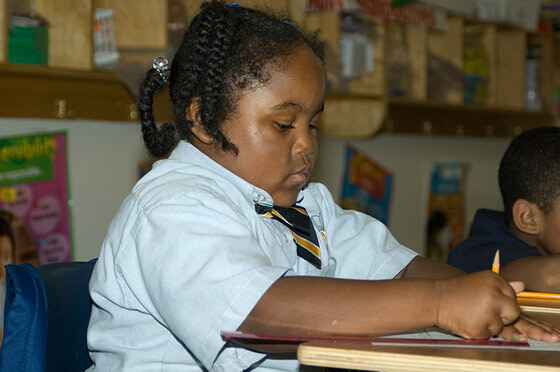 At Imagine Foundations at Leeland Public Charter School, we seek to balance excellence in reading, language arts, and math with instruction in science, social studies, and the arts, and we measure our progress through student learning gains and proficiency levels. Our educational philosophy is grounded in the belief that the content of what children learn is very important and that it is inadequate to focus primarily on teaching skills and techniques to pass tests. In order to help children thrive academically, learning must go beyond skill acquisition to the mastery of content that provides them with the ability to apply what they learn to new situations, solve problems, and create new ideas. This depth of understanding leads to a love of learning and an ability to independently develop innovative solutions to problems and create new knowledge. Click on this link to learn more about, and to download and review a PDF of, the foundations of our instructional model and how each component supports the development of the whole child. As you can see, the Imagine Foundations at Leeland program provides our children with the basis for future learning and guides our creation of a joy-filled learning environment. Imagine Foundations at Leeland has selected the Core Knowledge Sequence to provide content standards that will guide coherent instruction from grade to grade, encouraging steady academic progress as children build their knowledge and skills from one year to the next. Why Core Knowledge? Our approach to curriculum is to operate within sound, tested educational principles. These principles serve as guidelines for the staff to evaluate and select the instructional resources most appropriate to meet the educational needs and aspirations of every student. The Core Knowledge Sequence specifies the majority of the content taught in the core academic subjects. Many schools are de-emphasizing specific and sequenced prescriptions of what students should know in favor of an increased focus on skill development and strategies to better engage students. While skill improvement and relevance are important aspects of learning, we believe specific, sequenced, and integrated road maps for how and when students should master specific information is critical for building a broad and strong academic foundation. This promises to give children access to a literate society and provides young people with the broadest range of options for their futures and professional lives. In addition to Core Knowledge, the Imagine Foundations at Leeland content standards will incorporate the Maryland Voluntary State Curriculum, for several reasons. First, Maryland’s curriculum standards are demanding and support the development of an academically rich learning environment. Second, the Imagine Foundations at Leeland staff fully understands that the Maryland School Assessment (MSA) is based on the Maryland Voluntary State Curriculum and strives to prepare its students for the high stakes assessment as thoroughly as possible. By aligning the Core Knowledge Scope and Sequence and the Maryland Curriculum Standards our teachers will be able to shape their unit plans and daily lesson plans to ensure that Core Knowledge content objectives and Maryland Standards are met. 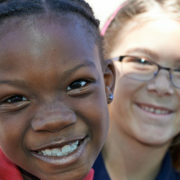 The academic program for all students at Imagine Foundations at Leeland incorporates the educational philosophy known as “differentiated instruction.” The model of differentiated instruction places the child at the center of teaching and learning, and requires teachers to tailor their lessons to students’ learning needs rather than expecting students to modify themselves to fit the curriculum. Teachers who are committed to this approach believe that who they teach shapes how they teach because who the students are shapes how they learn. In other words, at Imagine Foundations at Leeland we understand that each student comes to school with a different set of learning needs and varying degrees of academic skill development. Therefore, our teachers constantly assess and adapt the instruction per child, based on their individual needs and talents. Differentiation does not mean teaching at a slow pace so that everyone can keep up or drawing attention to the limitations of others. Rather, differentiated instruction involves teaching with student variance in mind. It means allowing teachers to focus on the level of learning in the classroom rather than adopting a standardized approach to teaching that presumes all learners of a given age or grade are essentially alike. In other words, through differentiated instruction, Imagine Foundations at Leeland teachers plan varied approaches to what their students need to learn, how they will learn it, and how they can express what they have learned. We believe this differentiated approach to teaching — matching each student’s abilities with appropriate material and adapting to their needs based upon the teacher’s constant assessment of all students — leads to improved academic performance outcomes. At Imagine Foundations at Leeland, we utilize “Response to Instruction & Intervention” (RTI2) to provide early, effective assistance to children who have difficulty learning. The RTI2 method has been developed as an alternative to the more traditional approach of identifying learning disabilities through an ability-achievement discrepancy model, which requires children to exhibit a discrepancy between their ability, often measured by IQ testing, and their academic achievement, as measured by their grades and standardized testing. RTI2 seeks to prevent academic failure through early intervention, frequent progress measurement, and increasingly intensive research-based instructional interventions for children who continue to experience difficulty in learning. Students who do not show a response to effective interventions are likely (or, more likely than students who respond) to have biologically-based learning disabilities and to be in need of special education. Our hope is that, by implementing early intervention through RTI2, we can improve the academic performance and behavior of children who have difficulty learning, and at the same time reduce the likelihood that any student is wrongly identified as having a disability. Most schools use the percentage of students who are academically proficient and advanced as the primary source for their performance measurement. At Imagine Foundations at Leeland, however, we place a greater emphasis on same-student growth, or what we term “learning gains.” By testing students at the start of the year, our teachers learn what students know and in what areas they need the most improvement. Testing students at year-end then shows how far each student advances during the school year. Same-student learning gains allow us to assess how well our school helps students learn, compared with year-end proficiency tests that measure only what students know at a given point in time. 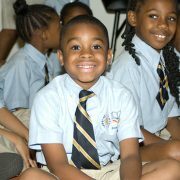 Our aim is for each student to grow academically a year or more every year they attend Imagine Foundations at Leeland. Of course, if our students’ tests show proficiency and advancement at grade level or higher, we celebrate that as well. While we are very pleased with the academic achievement of our students, we know that many children arrive at Imagine Foundations at Leeland behind grade level in math and reading. It may take more than one year for our school to help students catch up and overcome the shortcomings of their previous school experiences. to determine student progress (annual learning gains) by the end of the year. We rely on several forms of standardized tests to achieve our assessment goals, including those used by other members of the Imagine family of schools. Standardized tests offer a uniform way to measure student proficiency in the curriculum as well as academic growth for a given year. Additionally, we also administer interim, or “benchmark,” assessments several times per year. The purpose of these assessments is to monitor student mastery of the curriculum as it is taught over the course of the year. The data from the benchmarks inform teachers and staff about individual student and classroom needs so that they may provide instruction, support, or enrichment. Creating and sustaining a high-quality school involves much more than good test scores. Although academic achievement is critical, it is only one of six measures we believe to be necessary to evaluate a high performing school. We aim for balance and wholeness as we achieve greatness in all of these areas. Imagine Foundations at Leeland employs a Crisis Intervention Teacher to deliver a comprehensive guidance and counseling program to all students. The Crisis Intervention Program is designed to promote student self-confidence, positive attitudes, relationship skills, and motivation for success, decision-making skills, and an emotionally healthy school-learning environment. The staff work to create partnerships with families to support growth in student academics and career and personal/social development. Imagine Schools places a strong emphasis on each child’s character development and measures progress in student behavior and overall school culture. As a result, Imagine Foundations at Leeland integrates a character education curriculum, such as Core Virtues, into all areas of the school community.